Here’s a subject that is close to my own heart – the deployment of human shields in Damascus. Thank you to my friend, Franklin Lamb, who has joined these brave souls on the front line at Qasioun Mountain, most of whom believe (plausibly) that the American missile attack has only been paused and not stopped. At the height of the war scare here in early September, a group 9 primarily Sunni, Christian, and Alawite students and activists, led by a charismatic and agnostic pro-Hezbollah Lebanese Shia woman from Hermel in Lebanon’s North Bekaa Valley, set up a Human Shields and Observers camp to protect the Syrian TV channels, radio and communication towers situated at the crest of Mount Qasioun which rises up 1,151 meters (3,776 ft) at its crest. The small community has the air of a sit-in as well as a teach-in. Within a few days, their numbers exceeded 200, and at weeks end the “Ala agsadona” (“over our dead bodies”), website was hosting thousands of visitors every day. “We are prepared to take the first cruise missile with our bare chests,” explained one young man, an architecture student at Syrian University, a relatively expensive private institution which offers majors in French, English, German, Italian and other western languages. 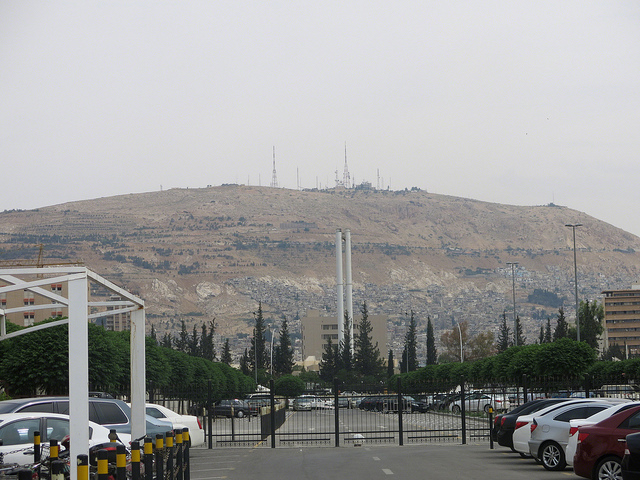 Mount Qasioun, transliterated from Jabal Q?siy?n, is the high mountain that overlooks Damascus from the north, and many assume its communication towers would be among the first targets of American cruise missiles. Normally a popular tourist spot for hiking and rock climbing, the area is cherished by Syrians as a place of beauty and peace, where one can get away from life’s pressures and enjoy the mountain’s cool temperatures. Here one may also dine at a range of glass-fronted restaurants from which the whole city may be viewed in panorama—and as Damascus has expanded over the years, some districts have even been established on the foot of the mountain. Perhaps as a sign of the times, these days Qaisoun is also honeycombed with Syrian armed forces. The special connection of Mount Qasioun and the people of Syria is perpetuated by oral and written histories signifying what the Mountain has meant to this region since prehistory. On the slopes of Jabal Qasiun, just above the “Ala agsadona” camp, is a cave, which, it is said, the first man, Adam, inhabited for a period. Historians have recorded a variety of stories about Ibr?h?m (Abraham), and ‘?s? (Jesus) also having sheltered and prayed in it. Medieval Arab history books speak additionally of it as the site where Q?b?l (Cain) killed H?b?l (Abel). Moreover, it has been known for hundreds of years as a place where prayers would immediately be accepted by God, and in Syrian history when a calamity threatened the people, and especially in times of drought, rulers of Damascus would climb to the cave and pray for safety and often for rainfall. During these days of slaughter and the threats of US-led western bombing, the camp has come to symbolize Syrian resistance to foreign hegemony and occupation. Some of the most active and inspirational youngsters up at “Ala agsadona” camp are in their “adolescent” 60’s and 70’s. Many of them have lost loved ones during this God-awful continuing crisis. The camp is on high alert 24/7 given the threats against its dwellers from foreigner jihadist groups—given also that the mountain was targeted by mortars, as well as bombed by Israel, last spring. Several army check points minutely screen all traffic heading up its slopes. But despite the various threats, the attitude and general esprit inside “Ala agsadona” is one of resistance, pride and patriotism, not exclusively for the current regime, but intensely focused on Syria—its ten thousand-year history as the cradle of civilization and culture, as well as its centuries as the region’s superpower. After hearing of preparations for large numbers of Americans and other foreigners to come to Syria to serve as human shields and international observers in solidarity with the Syrian people, Ms. Dandask made an appeal to “all the free people in the world, all those who believe that people have the right to decide their own future,” to join this grass roots campaign. Many Syrians have offered to open their homes to foreign supporters of Syria, who likely would be camped at key potential bombing sites. Asked if the current pause in Obama Administration bombing plans would lead them to break camp, the response has been that the participants will remain vigilant, prepared to resume their full numbers, and to man their posts should the threats of immediate bombing re-surface. A majority of the Quisoun “minute-men and women”, reflecting the Syrian population’s general view, believe that the current pause is just that. And that American bombing is still likely. Yet as appears to be the case across Syria, there is a palpable sense of relief, even some limited euphoria at the moment, along with hope and optimism, that the United Nations, Russia, Iran, the USA, and Syria can settle this crisis that has destroyed such a great part of Syria and brought widespread death and destruction to so very many of her families. This entry was posted in Uncategorized and tagged Father Dave, Franklin Lamb, Lebanon, Mount Qasioun, syria. Bookmark the permalink.